Looking for a creative way to bake or present a loved one with a uniquely packaged treat? Consider using a Mason jar in place of your everyday bakeware. Here, we'll show you exactly how to use a Mason jar for baking. Mason jars can be used to bake a variety of cakes and cheesecakes, as well as quick breads and other dessert recipes. You can use your favorite box mix or homemade layer cake, cheesecake, muffin or quick bread recipe. 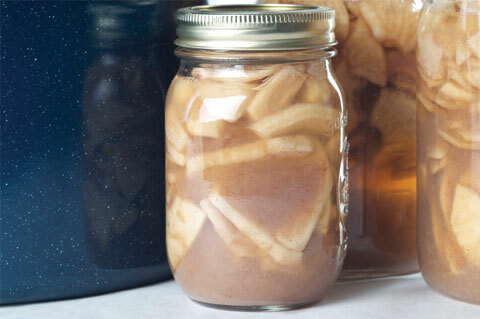 As in canning, sterile jars are crucial to avoid bacterial growth. Place jars in boiling water and let dry completely. Oil and flour the inside of the Mason jars. To determine how many jars you need, consider that pint-sized Mason jars can hold the equivalent of about two cupcakes (most box cake mixes will make 24 cupcakes so you will need 12 pint-sized Mason jars). Preheat oven to 325 degrees F. Prepare your cake, cupcake, cheesecake or quick bread batter just as you would for regular bakeware. Fill Mason jars with batter until they are about two-thirds to three-fourths full. Mason jars are meant to be used in hot water baths or pressure canners and can't be placed in a dry oven without a water bath. Place Mason jars in a tall-sided roasting pan or baking dish and fill pan or dish with hot water. Pint-sized Mason jars will take 25 to 30 minutes while quart-sized Mason jars will take 50 to 60 minutes, depending on the baked good. For cakes, cupcakes, and quick breads, as soon as you take the Mason jars out of the oven and roasting pan, place lids and screw rings on them. For cheesecakes, take Mason jars out of the oven and roasting pan, and let them sit uncovered until cool. Add preserves, if desired. Seal Mason jars with lids and screw rings. You can leave your cakes, cupcakes and quick breads at room temperature for up to a few days. Mason jar cheesecakes need to be refrigerated and eaten within three days. Though some Mason jar baking pros can keep Mason jar baked goods in the pantry for months, we suggest treating Mason jar treats just as you would baked goods baked in regular bakeware. Baking in Mason jars gives you an opportunity to give uniquely packaged baked goods to your friends and family. Wrap pretty ribbon around sealed Mason jars with a recipe card complete with ingredients and instructions for baking the dessert in a Mason jar the next time around. Michele Borboa, MS is a contributing editor for SheKnows.com specializing in health, fitness, and all things food. She is a veteran health and fitness professional, personal chef, and mom in Bozeman, Montana. She is also the author of the time-saving cookbook Make-Ahead Meals Made Healthy (Fair Winds Press, July 2011). You can contact Michele at michele.borboa@sheknows.com or give her a tweet at http://twitter.com/micheleeborboa.